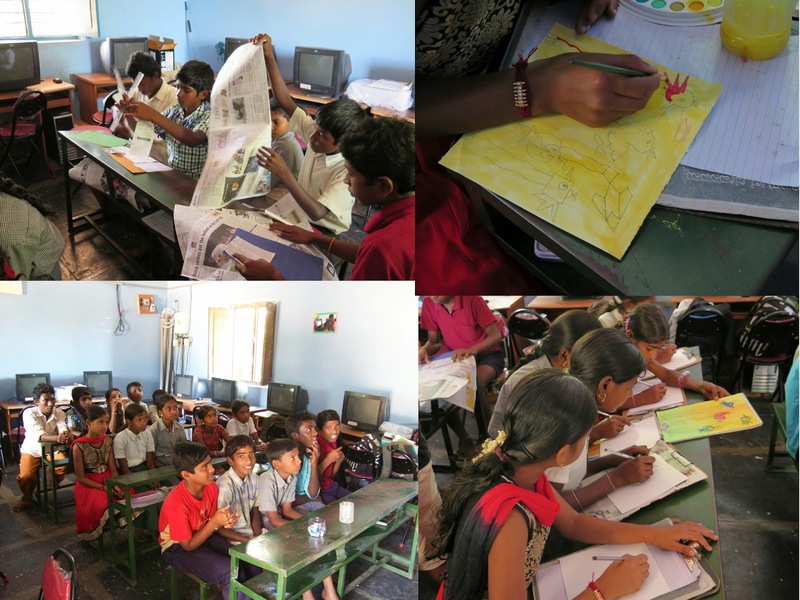 I always wanted to conduct an art camp for rural kids. Intention being, to introduce art to them and help them explore their hidden talents which without exposure to the world of art may remain unidentified for ever. The origin of this thought perhaps could be found in influence of my painting Guru on me. He dedicated his entire life for art. He taught for free, and painted for free or a very minimal charge that would barely suffice for the materials he would have to buy in order to make them. Also, I realised the talent in me very late; when I was in pre-university (11th grade). This was why I thought of conducting art camps for children that could help them identify their skills and interests at an early age thus opening a new opportunity for them as they grow older. I was particular about doing this in a rural area since as compared to their urban counterparts, the rural kids have minimal or no exposure to art. What was shocking to me was that they had no art classes in school. Having studied in a Kendriya Vidyalaya, I have had exposure to most of the sports, art of course and all other cultural activities. So an absence of recreation and introduction to culture in a child's life is a shock to me. This trip to Badeladaku (Pronounced Badiladki) changed my perspective all together about several things. It opened the doors to a world that I was ignorant towards. And in many ways I was glad that these three days happened to me. I met Stefan through Couchsurfing website where he posted request for volunteers for his "The Green Education" project for a month in this small village of Badeladku in Kudligi Taluk of Bellary district. I was not available for a month but I sure wanted to be a part of this good cause. In our exchange of emails that followed my passion for art met Stefan’s good intentions and I decided to conduct an art camp for the kids during a long weekend. We met once before the camp in Bangalore and discussed what and how this would happen. Stefan has been visiting this village for 3 years now and he has setup a computer lab for the kids of Kurisiddapamarriyama Navara Sarakari Prouda Shalla (Government school). Most of the money comes from him and from the contributions by his friends. During his stay, he teaches computer and English to kids. This time he was accompanied by his wife Yulia. I call them true global citizens because Stefan is from Romania, Yulia from Russia. They have lived in Spain but are now working in China as English teachers since a year and are on a humanity mission in India. What more is required to inspire someone to be part of their good initiatives? On the night of 22nd August, I boarded a Volvo bus to Hospet. I had had a very busy week at work but I took some time off in the evenings to plan what I was going to do at the camp. Got all the material required but this being my first ever workshop, I was unsure of how it would turn out. But like always, I calmed myself down and decided to go with the flow. The bus left Majestic at around 10:50 PM. For some reason it smelled badly of dampness. This bus was so unlike the Volvos that ply to Mangalore. Anyways, tired that I was, nothing stopped me from falling asleep in no time. In the morning I realised that we were actually crossing Kudligi on the way to Hospet. I would have had to walk for 3 kilometres from bypass road to get to the town of Kudligi which I might have done had I known. But I had not bothered to do any research on the travel and had followed the instructions to reach Hospet and take a bus to Kudligi of which there are one every hour. I reached Hospet at around 6:00 AM. Immediately boarded the bus to Kudligi which left at 6:20 AM. Kudligi is about an hours drive from Hospet. I enjoyed the beautiful view. It was so green and lively that I did not mind my drive back on the same road. Anyway there was no hurry. However, I was tired from my bus journey and wanted to reach my destination at the earliest. A slight headache made this need more important. That was around the time when our driver tried to overtake a truck and in order to miss the oncoming traffic made a hurried left turn and got hit by the truck and had the rear mirror broken. He immediately parked the bus and began a heated debate with the truck driver. I bothered not to interfere but after about five minutes, decided to check what was happening. By then the argument was coming to an end and the villagers were asking the north Indian truck driver to pay the amount that the Bus driver was demanding and be done with it. He reluctantly and helplessly paid the money. Everybody knew that it was not the truck drivers fault and they talked the same while returning back to the bus. I felt extremely bad of what had happened. Not just for the poor truck driver who had to lose Rs 200 for no fault of his but also for myself. I had easily surrendered to my selfish needs just like the other passengers and failed to stand up for what is right. I was more worried of my headache and delay than defending the truck driver whose only weakness was his lack of knowledge of the local language. That is when it occurred to me that if this is what we humans are becoming as we grow older, then I must try to change and stand up for what is right, what is just. Another reason to this decision was also some recent stories of injustice that I have been hearing to and that are happening around me. That new learning, that new thought was the only way I could have felt happy midst the feeling of guilt. I reached Kudligi town at around 7:20 AM. It is a beautiful little town. Decently crowded and well maintained. I enquired with locals about Mookambika lodge that was opposite Police station. I met Stefan and Yulia there. They had booked two rooms. Gautam, an engineer from Mysore was in the other room. He had recently quit his job and before starting a business wanted to take a break. He was with them for a month. Rajiv, another Couchsurfer had come down from Bangalore this weekend. I had my morning tea and quickly freshened up. The water pump at the lodge was not working so we had to share the only two buckets of hot water that was available. Stefan, Yulia and I quickly discussed the plan. 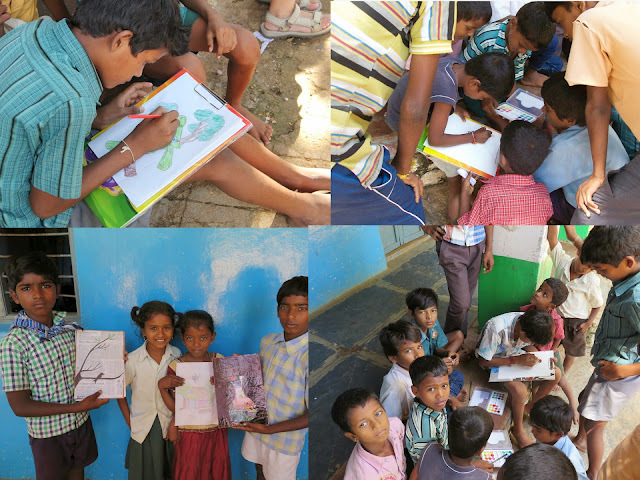 While I conducted the workshop for 15 kids inside the class room, others would engage the rest of the kids outside with some drawings and painting. I had no idea of what this was going to be like but they assured me that the plan to engage the other kids was a must and it could get really erratic otherwise. We were ready by 9:30AM and had breakfast in a restaurant near by. The restaurant and the lodge is owned by the same guy. We then walked to the circle where the Shared autos that ply from Kudligi to Badeladaku (5kms) are parked. The route runs midst the corn fields and the view fills you with freshness. As soon as we got down from the auto a bunch of kids came to us greeting "Good Morning" and shook hands with us. I now saw what Stefan had meant when he told that I would become a celebrity in no time. They followed us all the way to the school where more kids joined us. They were so happy to see us. It was a holiday on the occasion of the death of a prominent poet and thus not all the kids who had given their names for the camp had turned up. But there were plenty others willing and we just did not have enough room. There was another death that happened in the village; a death perhaps not as prominent for the nation as that of the poet but equally devastating for the family involved. A village boy returning from army had gone swimming in a lake and had not returned. He was then found to be dead. As we walked to the school, loud screams of agony from the house filled the air. At school, there were hundreds of kids circling us and requesting to participate in the camp. We had get into the computer lab for arranging and close the doors behind. Village transformer was broken so there was no power. We had no choice but to open the windows for fresh air and light. And as soon as that was done there were kids everywhere trying to peep in and see what was happening. We arranged the benches in three rows and decided to include 15 kids that day for the camp. Gautam and Stefan selected the kids for the day. At first, I had arranged a small presentation for the children on colour theory and different forms of art. My intention was to introduce them to Cubism, Surrealism, impressionism, fauvism and contemporary art so that their relation to art with only realism would be broken. I think thus one can explore art in different forms and not just as figurative. After this short presentation I divided them in three groups and gave them three different craft work to do. First group was assigned to do a collage using magazines and then sketch an image on it and colour the background allowing the magazine to show up only within the sketch. Second group that consisted of only girls painted some cartoons and experimented with water colour. Third group made a collage again but of news paper cut outs and had to draw silhouettes that would stand out on a background of texts. Almost immediately they got on to work and I was called in all direction for help and suggestions. Yulia helped other groups as I was engaged with one. The energy and enthusiasm that they had exceeded anything that I had expected. Everyone wanted me to help them out and kept calling me repeatedly. In an hour and half that followed every kid had something interesting to share. But I must admit that I was totally exhausted by the end of the workshop. There was too much energy there and everybody wanted to do something or the other. 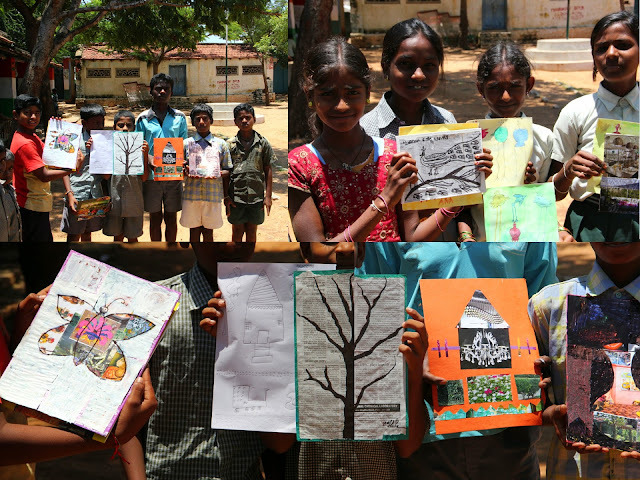 Outside the classroom, Stefan, Gautam and Rajiv engaged the kids by providing them trace papers and sketch books. Almost every kid had come up with interesting art work. The kids were screaming with joy and also requesting for paint and paper that they could use later. I was almost tired consoling each one of them that I would give away all the material to them on Monday. We decided to head back to town by around 1:30 PM. We had lunch at a local Dhaba. The food was okay but that seemed like a descent option for then. After lunch we returned back to the village. 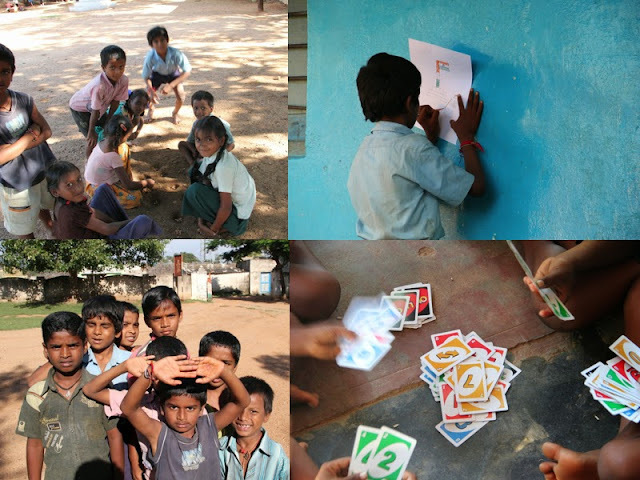 The entire evening was spent teaching kids to play Uno cards and then playing with them. I had some temperature so I decided to relax a little by taking pictures. It was interesting to see some kids still interested in continuing the morning session. They took colour pencils and drew sketches. During the afternoon session we had visitors from the village. The son of one of the panch’s (Village head) was one amongst them. I had already heard about him that he had opened a private school in the same village and had requested for few computers to be moved there which was politely declined. We wanted the kids to have the Uno cards but it was taken by him to be later given on need basis but the kids did not believe in that happening. He was also surprised when I told him that I was going to hand over the art materials to the children after the workshop. At around 5:30 PM or so we decide to call it a day and return to town. But the last auto had left so we had to walk back. 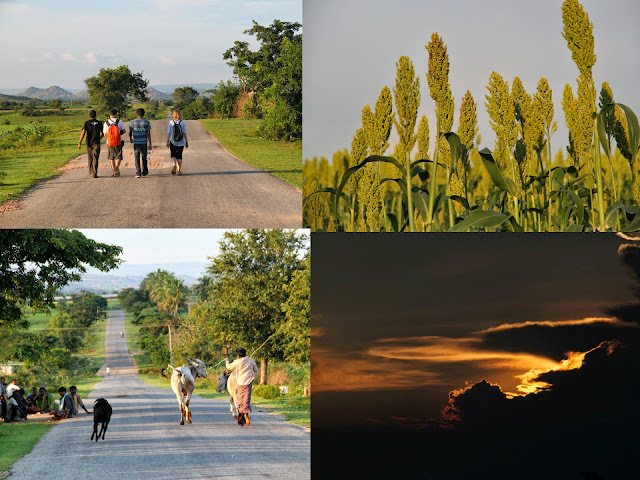 It was a nice walk beside the corn fields. Sunset in backdrop only added to the serenity that this place was already providing. On our way back we saw the transformer being carried away for repair on a tractor. The sight of the transformer being carried away on a tractor with loud music played reminded me of a Ganesha Visarjan. I smiled at the correlation. After having walked about a kilometre or more, we got a ride on a tractor. A wonderful day had come to an end. All through the ride back I was filled with immense happiness. I realised that I had not helped the kids but they had helped me; in finding a purpose to my art, a purpose to my being. It felt so good to be amongst kids who do not judge you for who or what you are. All they want is to know you and be attended. Back in the lodge the caretaker informed us that after a tiring day they had finally fixed the pump. Gautam and I had dinner at a local Khanawali that night as the others settled in for some bakery food. I enjoyed a good meal that consisted of chapatis and rice. Almost exhausted, I crashed immediately after lying on the bed.